Faith To Face Ministries’ Senior Pastor and Founder, Bishop Dr. Mark D. Vaughn was born and raised in Elmira, New York. It was there, in 1975, that he accepted Christ as his savior at the age of 11. By the time he left for college 7 years later, he had grown in the faith and had established himself as a bible scholar and teacher of all age groups. In 1984, Vaughn earned an Associates Degree in Physics w/Honors at Rochester Institute of Technology (Rochester, NY). During his time in Rochester he became a youth leader at Bethesda Church of God in Christ (Bishop Ronald Hoston, Pastor). The Lord used him and fellow RIT student, Jeanette Brooks (who became Mrs. Jeanette Vaughn in 1986 and is now “the jewel” of Faith To Face—our 1st Lady), to win many college students to the Lord. Five miracle children have resulted from their nearly 24 year union: Karissa, Kyela, Cullen, Carrington, and Clayton. In the Fall of 1986 Vaughn relocated, with his new bride Jeanette, from Rochester to his hometown of Elmira. In early 1987, he accepted the call to ministry and was licensed in ministry later that same year by Dr. Cephus McGee, Jr., pastor of All Saints’ Home Church of God In Christ, the church that he’d grown up in. Vaughn became the Youth Minister and a leading ministerial associate at the church. He continued his studies at Alfred University where he earned a Bachelors degree in Physics in 1991. While studying at Alfred University, he also worked full-time as a research technician for Corning Incorporated (where he celebrated 22 years of employment in 2010). Today, Vaughn is the Manager of Technical Talent Pipelining for the company’s Technology Community. His technical contributions have been widely cited, and in 2007 he was nationally recognized as a Black Engineer of the Year by Career Communications Group. Rev. Vaughn continued to grow in grace and in the knowledge of his Lord and Savior even as he yielded to the leading of the Lord to pursue graduate studies at the University of Rochester (where he earned a Master of Science degree in Optics in 1993) and at Georgia Institute of Technology (where he earned a Ph.D. in Electrical Engineering in 1998). Throughout this season of academic training, Pastor Mark became more and more active in ministry. He was ordained in 1996 by Bishop Chandler Owens, presiding Prelate of the Churches of God in Christ and accepted the call to pastor in 1997, a call that he’d first heard in 1985. In 1998, Dr. Vaughn founded Faith To Face Ministries, along with his wife, in Corning, New York. The ministry became one of the fastest growing, multi-cultural congregations in the area and is now highly regarded as a local assembly with a global vision. Dr. Vaughn has continually provided cutting edge vision and leadership, and is world renowned for his teaching and preaching (having been the guest revivalist at city-wide crusades and leadership conferences in Liberia and Ghana, West Africa several times since 2003). During Pastor Vaughn’s travels abroad he has had audiences with national leaders and directed missions giving amounting to tens of thousands of dollars. These moneys are being used to erect shelters for the displaced, provide clean drinking water and medical care for those with no other access to it as well as schools and scholarships benefiting hundreds of student and adult learners. Though a global visionary, Dr. Vaughn is also a highly regarded public servant at home. He presently serves on the Board of Directors of the United Way of the Southern Tier and served two term as an elected member of the Corning-Painted Post Board of Education. In 2006, Pastor Mark acknowledged the call to the elevated office of Bishop – a call he’d first received in 1985 (the same year he was called to the ministry). This acknowledgment was further validated in 2007 when the pastors in Monrovia, Liberia, with whom he’d been in relationship since 2001, unanimously agreed to make him the Bishop over their fellowship which is now known as the On The Mark International Pastoral Fellowship (OHMIPF). 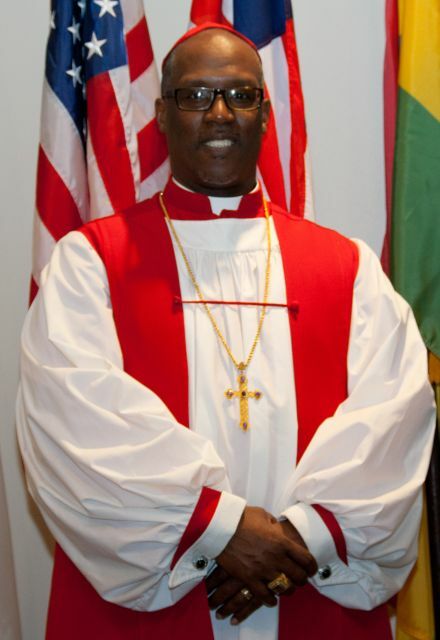 Bishop Vaughn was consecrated to the office of Bishop on November 30, 2007 in Corning, NY. OHMIPF has since expanded into Ghana with plans to reach into Nigeria and Senegal in 2011. For more information on Bishop Vaughn or On The Mark Ministries, please visit www.OnTheMarkMinistries.org.